Note: My mom is so cute, I found this post she wrote for me in my inbox. Thanks, Mom! My mom recently saw an article about home made profiteroles. After looking at the recipe she thought it was very similar to a cream puff recipe she’s been using for decades. In fact it was in the first cookbook she received as a wedding gift back in the 70’s…Craig Claiborne’s The New York Times Cookbook. My mom hadn’t made them in years since my dad now is king of the kitchen. 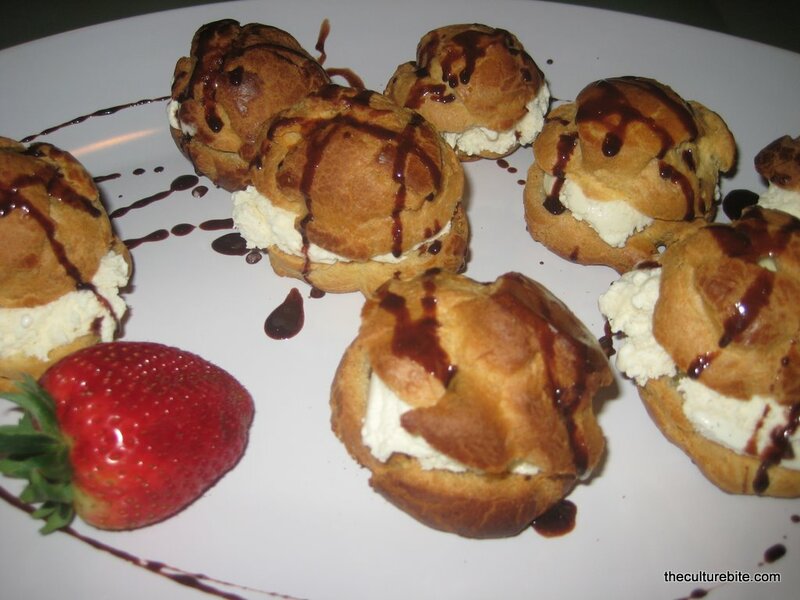 Whether it’s profiteroles or cream puffs you are making, it starts out the same. It’s really Choux pastry or pate a choux, which means it is cooked twice. The first time is when you fearlessly dump the flour into the boil mixture of butter and water and whip it in a frenzy into a ball of dough. Then, it’s transformed into delicious, crispy puffy balls waiting to be filled with whatever sweetness you desire …whipped cream, ice cream or custard. This no-fail recipe is easy, according to my mom. 1. Pre-heat oven t 450 F.
2. Combine water, salt, butter and bring to a boil in a deep pot. Remove from the heat and add the sifted flour all at once. Stir vigorously until mixture leaves the sides of the pot. If the ball does not form almost immediately, hold the pan over low heat and beat briskly a few times. Cool slightly. 3. Add the eggs, one at a time and beat until the mixture is smooth and glossy after each addition. 4. Drop pastry mixture by rounded tablespoonfuls onto greased baking sheet. Space two inches apart as the mixture will expand to several times its size. 5. Bake 15 minutes, then reduce heat to 350 degrees and bake about 30 minutes more until no bubbles of fat remain. 6. Cut each puff in half with a serrated knife. Fill with vanilla ice cream, whipped cream or custard. Drizzle tops with chocolate sauce. If you don’t use them all, put them in a ziplock bag and freeze until you have a sweet attack. If you want to make beignets, then drop in to hot oil and fry. Dust with powdered sugar.